1. In a large skillet, heat 2 tablespoons olive oil over medium-high heat. Add the beef, half of the onion and the jalapeños; season with salt and pepper. Cook until the beef is browned and the onion is softened, 7 to 10 minutes. Transfer to a bowl; reserve the skillet. 2. Meanwhile, in a large bowl, combine the remaining onion, the avocados and lime juice; season with salt and pepper. 3. In the reserved skillet, heat the remaining 1 tablespoon olive oil over medium heat. Add the mushrooms and garlic, season with salt and pepper and cook until golden, 7 to 9 minutes; stir into the beef mixture and cover with foil to keep warm. 4. Wipe out the skillet and return to medium heat. Working with 1 tortilla at a time, lightly toast on both sides for about 1 minute. 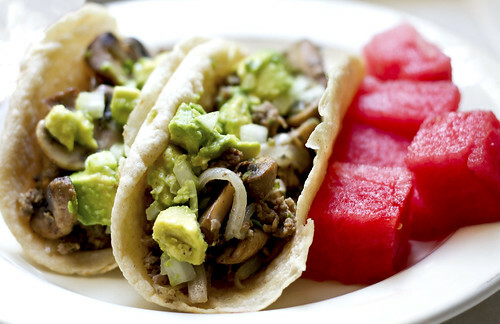 Stuff the tortillas with the beef mixture and avocado salad. Marinate chicken breast halves in lemon pepper marinade for at least an hour (sealed tightly in a plastic Ziploc bag works best). Remove chicken and discard marinade. Place chicken in a 9x13 glass baking dish and sprinkle with lemon pepper on both sides. Bake at 350-degrees for about 35 min or until juices run clear and chicken is completely cooked through. While chicken is cooking, heat a little bit of oil in a large skillet. Add diced onion, zucchini, bell pepper, and garbanzo beans. Saute until onions become clear. Add tomatoes and saute an additional minute or so until tomatoes become hot. Chop up cooked chicken into smaller pieces and stir in with sauteed veggies. Cook rice with water according to package instructions (or in a rice cooker). After the rice is cooked, combine remaining ingredients (from olive oil on...) and pour slowly over rice while fluffing with a fork. Add more lemon juice a little at a time if needed. 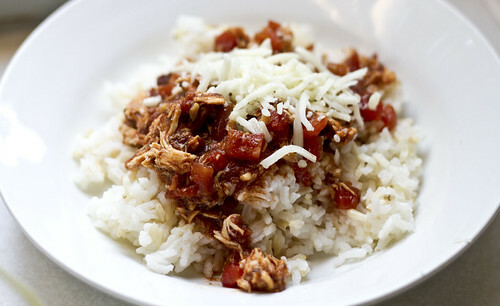 Put a scoop or two of rice on a plate (or in a bowl). Add sauteed veggies and chicken. Top each bowl with about 2 Tbsp. 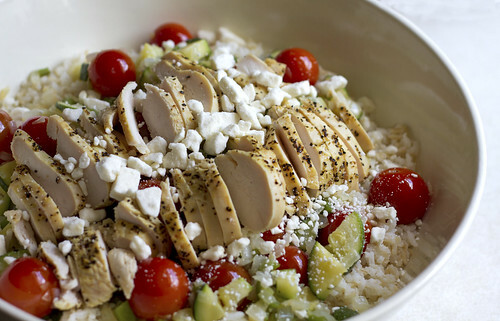 feta cheese (or to taste). 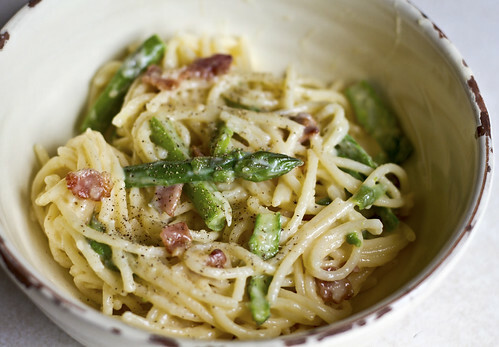 I loved the asparagus in this Rachael Ray pasta dish...and the garlic! It was pretty light and a great summer dinner, not to mention a yummy lunch the next day. I'll sub turkey bacon next time to keep it lighter. 1. In a large bowl, beat together the eggs and cheese. In a large pot of boiling, salted water, cook the pasta until al dente, adding the asparagus during the last minute of cooking. Drain, reserving 1/2 cup of the cooking water. Add the hot pasta and asparagus to egg mixture; toss to coat. 2. Meanwhile, in a large skillet, heat the olive oil over medium heat. Add the bacon and cook until crisp, stir in the garlic. Add the wine and cook until slightly reduced, about 1 minute. Stir the bacon mixture into the pasta, adding enough of the reserved pasta water to moisten; season with salt and pepper. While in a doctor's waiting room I was excited to find the May 2011 issue of the Food Network magazine to look through. 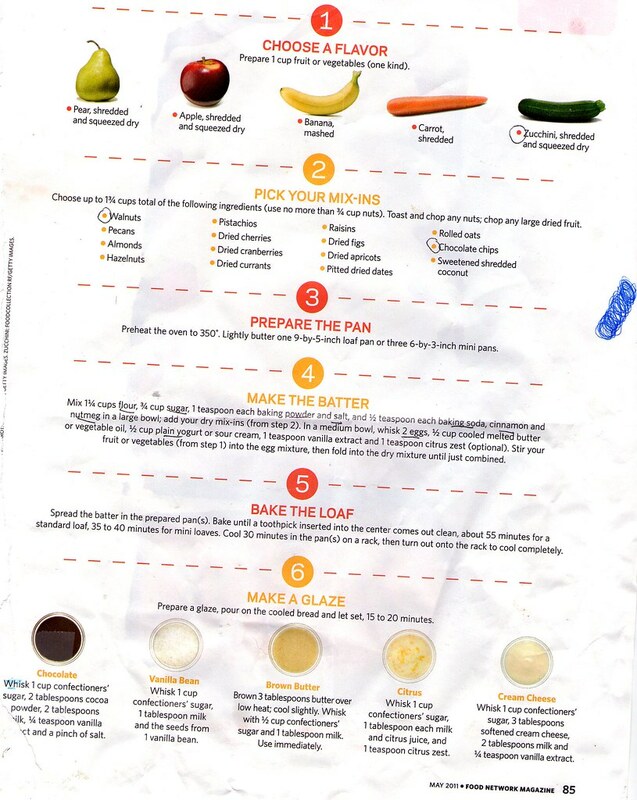 I LOVED this page of mix and match ingredients that you can use to make any type of bread you want. 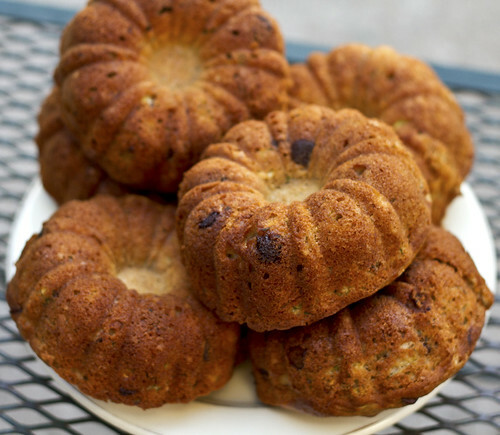 We used zucchini, chocolate chips and walnuts (and skipped a glaze) but I plan to try many more combinations! Preheat oven to 350 degrees. Lightly butter one 9x5 inch loaf pan or three 6x3 inch mini pans. Mix 1 1/4 c flour, 3/4 c sugar, 1 t each baking powder and salt, and 1/2 t each baking soda, cinnamon and nutmeg in a large bowl; add your dry mix-ins (from step 2). In a medium bowl, whisk 2 eggs, 1/2 c cooled melted butter or vegetable oil, 1/2 c plain yogurt or sour cream, 1 t vanilla extract and 1 citrus zest (optional). Stir your fruit or vegetables (from step 1) into the egg mixture, then fold into the dry mixture until just combined. Spread the batter in the prepared pan(s). Bake until a toothpick inserted into the center comes out clean, about 55 minutes for a standard loaf, 35-40 min for mini loaves. Cool 30 minutes in the pan on the rack, then turn out onto the rack to cool completely. This Rachael Ray recipe for breading fish was my favorite yet I think. It turned out crunchy and light tasting and was packed with subtle flavors. It was a huge hit with the whole family! 1. Using a food processor, grind the oyster crackers, Ritz crackers, parmigiano-reggiano, parsley, chives, thyme, Old Bay seasoning and garlic powder, if using. Transfer to a shallow bowl. Place the flour in another shallow bowl. In a third shallow bowl, beat the eggs and cream. 2. Fill a large skillet with enough EVOO to reach a depth of 1/4 inch and heat over medium-high heat. Preheat the oven to 200°. Season the fish fillets with salt and pepper. 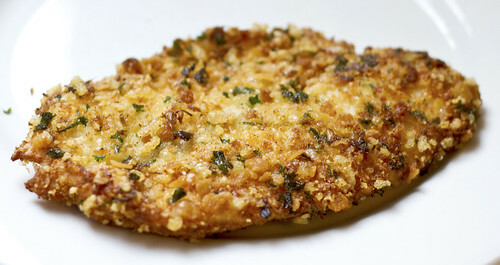 Coat the fish with the flour, shaking off any excess; coat with the egg mixture, then with the cracker crumbs. Working with 2 fillets at a time, fry the fish in the skillet, turning once, until deep golden, about 5 minutes. Transfer each batch to the oven to keep warm. After the end of the school year and just getting back from vacation I'm ready to get back to my meal-planning and cooking again! This was the last new recipe we tried that I never got around to blogging about. I had seen it posted a few times on Melissa's Bargains weekly menu but when I saw it also had good reviews on Favorites, I decided I better give it a try. Of course, the fact it was an easy crock pot meal helped in my decision too. It was easy and flavorful and light. I also LOVED the tanginess and the fact that my kitchen didn't get hot making it!